Is Liberty Ale an APA (American Pale Ale) or an IPA (India Pale Ale)? Ask Bob Brewer: Is Liberty Ale an APA or an IPA? Bob Brewer answers your questions about the world of beer and brewing. Brian (via Twitter): Love your Liberty Ale, is it an APA or an IPA? Bob: This is a good question, Brian, and the answer requires a bit of history. When we first brewed Liberty Ale in 1975, the term “IPA” (India Pale Ale) was not even close to being as widely-used as it is today. There were only a very, very few commercial examples of India Pale Ale in existence and these were not true IPAs by any stretch. The term “APA” (American Pale Ale) did not yet exist at the time. There were “pale ales” characterized by Bass Ale, and “brown ales” characterized by the likes of Newcastle. Other American brews called themselves “ales,” such as Rainier Ale, but these were often just strong lagers and were typically marketed in the malt liquor category. Fritz Maytag wanted to make a British-style pale ale with an American hop, which would also employ the almost-forgotten technique of dry-hopping. What he came up with was Liberty Ale, a true “pale ale” with a generous amount of Cascade hops added in the brew kettle, and an additional dry-hop with Cascade for good measure. By today’s definitions this is a classic recipe for an IPA. However, by the opinions of the style purists of the day (mostly British by the way), it couldn’t really be an IPA because it wasn’t right. The hops weren’t British. It wasn’t brewed over there. Wrong yeast. Too fizzy. And so forth. This wasn’t of primary concern to us because we weren’t trying to make an IPA, and we never called it an IPA back then. It was just a very hoppy pale ale. And by the way, Liberty Ale wasn’t immediately popular with the beer drinkers of the mid-1970s – with a few notable exceptions, one being Michael Jackson and another being me. With a monstrous (for the day) 47 IBU’s, it was far too bitter for all but a few. The first craft brewery of note to come along after Anchor was Sierra Nevada, if you don’t count the short-lived New Albion. Sierra Nevada’s first product was Pale Ale – pale and hoppy and much like Liberty Ale, but with different hops and some production differences. Just Pale Ale. Remember, the term “APA” did not yet exist and IPA was still primarily British. Fast forward a bit to the mid-to-late 1980s and the emergence of many more “microbreweries” (the term “craft brewery” didn’t exist then either). These microbreweries made almost exclusively ales of one sort or another because ales are easier and more forgiving to brew than lagers. Since the American brewing renaissance was incubated on the west coast, which just so happened to have proximity to the premier hop-producing regions in the country, it followed that many west coast brews evolved to be hop-centric. Moving right along, we soon had hundreds of breweries brewing similar ales, all of which were trying to get noticed. The ranks of the microbrewers of the day were mainly composed of enthusiastic home brewers who had been organized to one degree or another for years. These guys (and a few gals) had developed a formalized process for judging their products and began the process of defining style parameters. Along the way, an umbrella organization now known as the AHA, or American Home brewer’s Association, came into being. The AHA further defined beer styles and judging procedures, in addition to developing a training program for beer judging now known as the BJCP, or Beer Judge Certification Program. The BJCP has published style definitions and periodically adjusts them to accommodate new beers and the new style variants that seem to pop up on an ongoing basis. Amid the evolving climate of craft beer styles, the term “IPA” leapt to the forefront by the late 1990s. Pale ales had absolutely ruled for a number of years and were now almost mundane – dated even, according to some – even though they still were very popular and everybody still made one. Besides, “IPA” seemed to sound exotic and special. Just saying “IPA” sounded cooler. Suddenly everybody was brewing an IPA. While pale ales (or APAs) have pretty much stayed the same for years, IPAs are evolving at light speed. What is an IPA today? That question alone is difficult to answer, as the sheer number of IPAs in the market has pushed the style envelope to the limit. Enter our friends from the AHA, BJCP, Brewers Association (BA), and others to sort out the style definitions, which we will use here. Such is the evolution of style, description and indeed, language. Common usage will dictate the definition, new terminology supplants old, meanings evolve, and we move on. Now, back to Liberty Ale. We’ll leave the history behind and refer to the classic BJCP definitions as a base point. APA or IPA? (assuming an “American IPA” because of the use of American hops, etc.) The most current style guidelines of these two, as defined by the BJCP, overlap to a great degree. They are also nuanced to the point that I sometimes think that the people who write these things also write horoscopes. The main described difference is that IPAs tend to be more aggressively hopped at 40-plus IBU’s. APA is often described as sometimes being lighter in body and color and having IBU’s in the 30 to 45 range, but can be higher. Liberty Ale was a hop monster in the late 1970s, but by today’s standards it sits on the low end of the American IPA Guidelines for IBUs and ABV. But it’s still in there! On the other hand, Liberty also fits nicely in within the APA guidelines, albeit on the high end of the IBU scale for the style but well within the ABV range. As I mentioned, we didn’t call it an IPA back in the day because that wasn’t on our radar. Nor did we call it an APA because there was no such designation then. As it has evolved, the craft beer industry has pretty much defined our beer for us. We can now say that by virtue of dry-hopping, Liberty Ale was the first true IPA brewed in America, post prohibition. But again, by today’s standards and descriptions, it can also be called an APA. 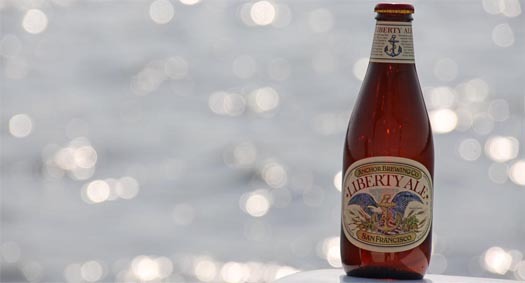 Liberty Ale was and still is a pioneering product that set the standard for many others to come. It resurrected the technique of dry-hopping and introduced it to a new generation of brewers. More than a few fellow brewers have told me that Liberty was the beer that inspired them the most when they started out and I take that as great praise for our brewery. So then, APA or IPA? It doesn’t matter where one chooses to place Liberty Ale. It fits comfortably as either, and also stands alone in a category all its own. This is a very interesting article, and few are greater admirers of Anchor Brewing and its products than I. However, a few historical observations are in order. First, APA is a modern term, apparently invented by Michael Jackson, to mean a traditional (top-fermented) pale ale made with Cascade or other American-grown hops that impart a distinctive citric, often grapefruit-like or piney taste. So APA is a variant of pale ale, which is English in origin. All APA and almost all American IPA use the new-style American hops. So the real question is, what if any is the difference between pale ale and IPA? In truth, there is none. This has been established conclusively by recent beer historians such as Martyn Cornell and Ron Pattinson, but even Michael Jackson’s 1970’s The World Guide To Beer does not distinguish between pale ale and India Pale Ale. He has a chapter on pale ale as such with mention that some was sent to India. When you read 19th century brewing manuals and other sources, it is evident that pale ale was the generic term. India Pale Ale, or India Ale, or East India Pale Ale, were terms used by pale ale brewers to describe their ale sent to India and elsewhere (e.g. Australia, California). This ale sometimes was more hopped than pale ale sold in England for the domestic market, and sometimes again, more attenuated. But there were no hard and fast rules in this regard and hopping and attenuation differed from brewer to brewer anyway. The term used in the pub (Jackson said this too) was “bitter” for this beer. Thus, bitter, bitter beer, pale ale, IPA, India Pale Ale, were and are the same class of beer, meaning originally a well-bittered, pale beer (not black like stout). Also, this beer was stored for a time – shipment overseas was a form of storage – to develop its qualities of dryness and to condition it. Dry hopping was optional: many brewers used the process, some did not. Today, for convenience and assist the judging process, BJCP has its own rules about pale ale and APA and what is English-style and APA. That is all well and good, but historically, there was mild ale (originally pale like bitter but less attenuated (sweeter), also, not stored long; pale ale/IPA/bitter; and the porter/stout family of beers. Another class, strong ale (e.g. Scotch ale, Burton Ale, Stingo) completes the picture. In this light, Liberty Ale was and is a pale ale: it is dry on the palate, considerably bitter and light-coloured. I am sure Fritz Maytag in the 70’s considered it a pale ale but one given an American twist via the Cascade hops – and he would have been right. Great post, especially taken as follow-up to the “Tale of Pale Ale.” As the “guy who knows a lot about beer” among my friends, the history and evolution of IPA is a common question. I feel like being able to clearly (or as clearly as possible) explain it has just gotten much easier with these two posts. Excellent article that sums up some of my pet peeves! One is the over categorising of beer by home brew and competition led organisations without the realisation that the commercial world of beer has a lot more crossover and elasticity over the style name of any given beer. The other is that styles cannot be set in aspic but develop and evolve, according to tastes, availability of ingredients, technology and most importantly the creative interpretation if a brewer! Is Liberty Ale an APA it an IPA? When drinking a great beer just enjoy it, don’t over think it! I understand Liberty Ale is celebrating 40 years this year. Perhaps you can let us know the exact date so that we can perhaps raise an extra glass! i *do* count the short-lived New Albion, historically. Jack McAuliffe has certainly earned his place in American Craft-beer history. New Albion was in business from 1976-83, and after Boston Beer’s revival of the American Pale Ale in 2013, it has been brewed with Platform Beer Company in Cleveland, Ohio. I’m very proud to continue my father’s work. Cheers and happy anniversary. Renee DeLuca, President, New Albion Brewing Co. I am actually drinking my first ever Liberty Ale as i type this. I have always been a fan of Anchor Steam for many years and actually consider it my all time favorite beer. But having tried LIberty Ale id have to say i have a tough decision to make.